How would you like to take photos of you on another planet? We may have to wait a little until space travel becomes mainstream, but I’ve managed to take some surreal photos in a place I’m going to reveal in a moment. Would you say this photo has been taken on Earth? There are deep cracks and crevices everywhere. It appears there are two rare plant species that grow here, but I haven’t spotted any. 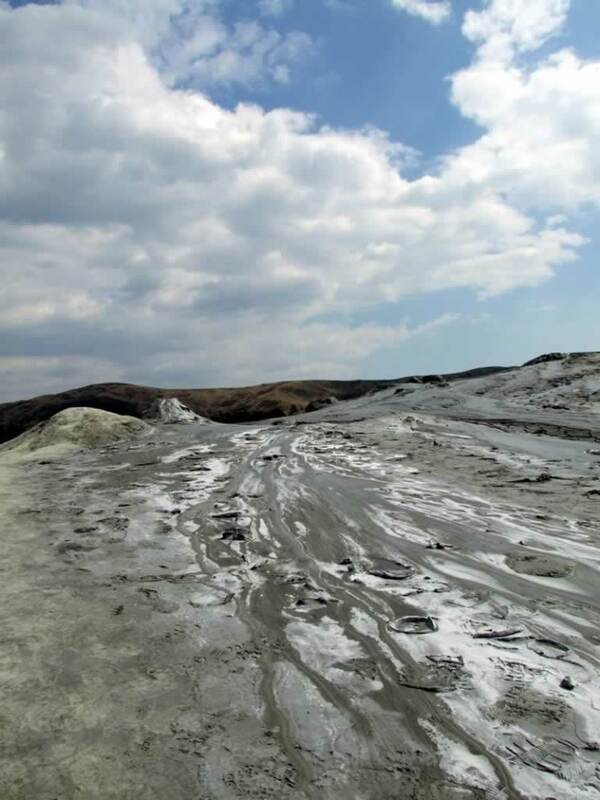 There is this unusual area in Romania, at Berca, nearby Buzau, called the Muddy Volcanoes or the Mud Volcanoes (“vulcanii noroiosi” in Romanian). 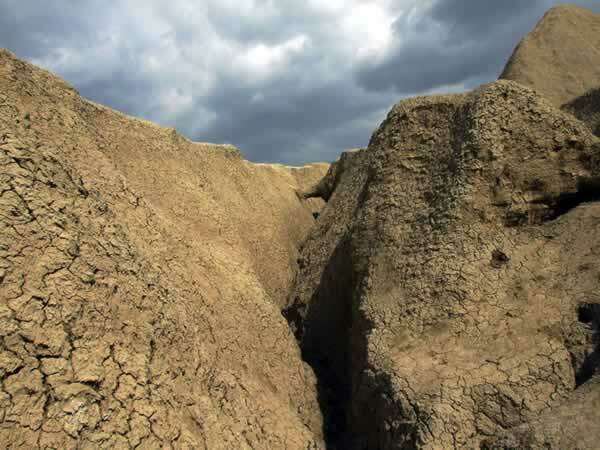 This is a natural reserve where barely anything grows, a place where the soil is all cracked and muddy. The ground feels somehow soft and unreliable, but you can step on it without collapsing. There might be a few steps when you’ll feel you’re going to get swallowed by the bubbling mud, but there’s no real danger unless you get the crazy idea to stick your feet inside of those bigger crates. How many years would you say it took this cone to become this tall? 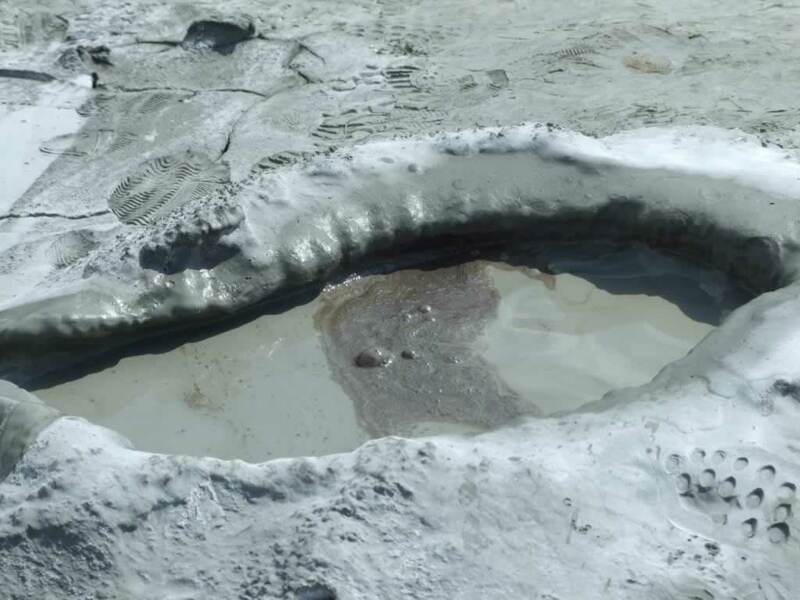 How Does a Mud Volcano Taste Like? Are They Hot? At first sight, you would believe that the volcanoes are hot. If you have the curiosity to put a finger inside the mud, you’ll be surprised to see that the mud is cold. If you are an adventurous spirit, you can taste the mud. You’ll discover it is salty. If you imagine I’d ever taste a mud volcano, you are wrong! However, if you’ve got some crazy friends who would sample just about anything, it’s enough to bring them over, and you’ll know everything you want about the taste and the texture of the mud. How Do Muddy Volcanoes Get Formed? This phenomenon comes from the natural gasses eruptions in this area. It has nothing to do with classic volcanoes that erupt and burn everything around them. As the natural gasses erupt from 3 km deep, they disturb underground salty waters and clay layers on their way to the surface, eventually overflowing through the small volcano crates while the gas emerges as bubbles. 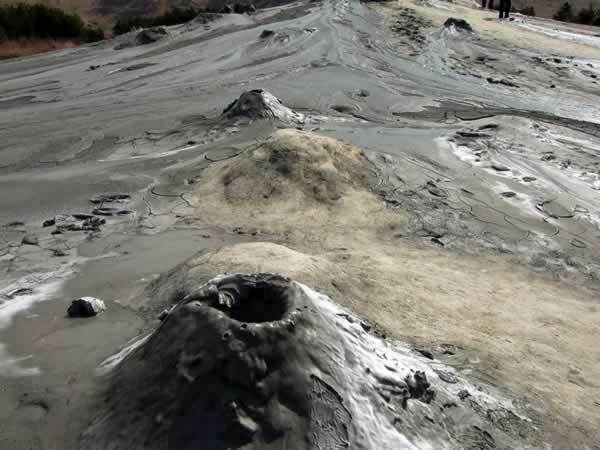 The salty mud dries off on the ground, contributing to the creation of these volcano-like cone-shaped structures. Wouldn’t you say they look like pimples? This back-grayish mud is already cold by the time it reaches the surface of the Earth, as it comes from its continental crust layers rather than from the mantle. Now you know why you don’t risk to burn your shoes by climbing on these cones. The entire area stinks like sulfur, but it is nothing to stop you from exploring. You only need a couple of minutes to ignore the odor. As there’s nothing around this area, the silence takes over the place, enabling you to listen to the birds signing and to the blurbs of the muddy volcanoes. There are only 144 km from Bucharest to Berca. You have to take the national road DN2 to Buzau. From Buzau, follow the route signs to Berca and Vulcanii Noroiosi. You might want to use your GPS, although the signs are quite clear and easy to see. The road is good. There is asphalt on most part of it. Here’s a detailed map of the surroundings of Berca, with the two groups of mud volcanoes marked on it. You have to search for Pâclele Mari and Pâclele Mici. If you decide to visit Berca and the volcanoes over a weekend, you may have to listen to children crying and running all over the place, Disneyland crowd style, their parents desperately shouting at them, fearing they are going to fall inside a crate. I tend to exaggerate, but the natural reserve can get quite crowded over summer weekends. If you want to hear the birds and the songs of the volcanoes, you should visit it during a week day. Are the Berca Mud Volcanoes Unique in Europe? The reservation is unique in Europe, similar phenomena being observed in Siberia and Australia. 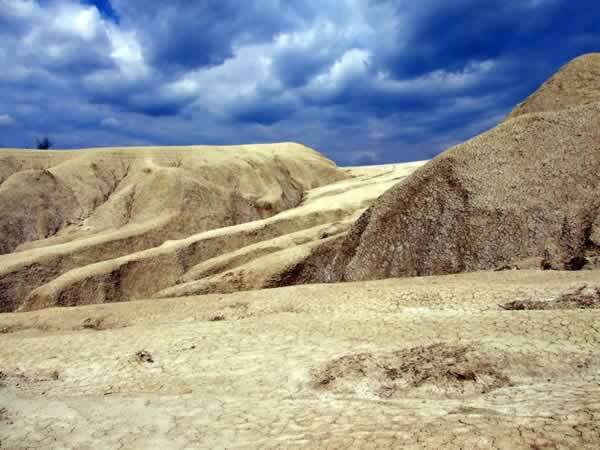 If you consider going to the Muddy Volcanoes, you can do it as one-day trip from Bucharest (it’s a two hours drive). I found this website that provides interesting information about H. Cognard, the French guy who discovered the Berca Mud Volcano phenomenon while he was searching for petroleum back in 1867. How would you like to take some photos here? What other strange places can you recommend? Thank you, Robyn! I’ve heard a lot about the Iceland mud volcanoes. If I ever get there, I won’t miss the chance to take some photos. Some great photos, I bet it’s hard to make mud look good.I can’t believe your friends ate it! I am no germophobe but I’d struggle to eat mud. Thanks, Rosie! I was very surprised when I saw my friend sticking his finger in one of those crates, and then put it in his mouth :). If you ever get to Berca to see the muddy volcanoes, you can try to find the so-called “Living Fire” (“Focul Viu” in Romanian). This is an area where there’s fire coming out from the ground. However, you need an all terrain vehicle to get there, especially after a big rain. All these places are around Buzau, and they can be all visited during a two-three day trip to this area of Romania. It makes sense now why volcano mud is often used for spa and skin treatments. The petroleum in this mud seems to be good for the skin. They use it in many cosmetic products, as well. Great post! I didn’t know there wer mud volcanoes in Romania. 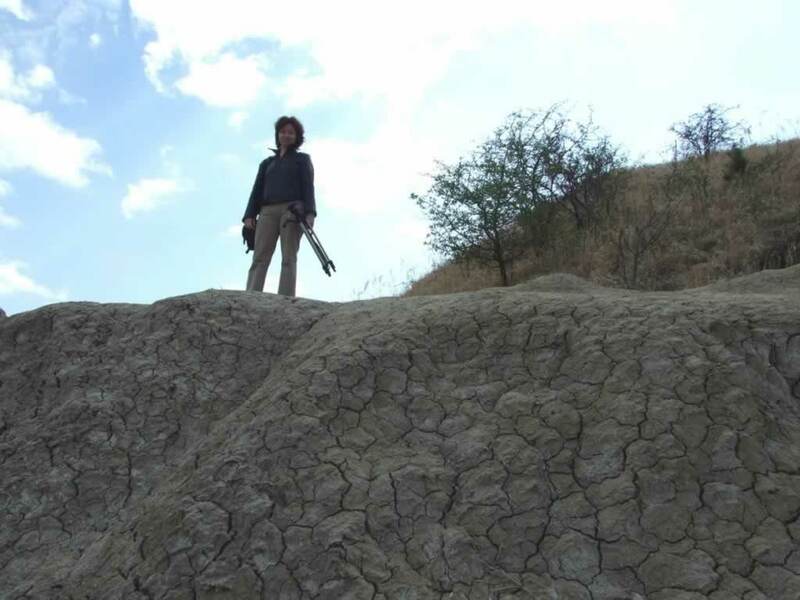 I’ve been to Azerbaijan and over there, they have a few mud volcanoes as well and I was also shocked when I discovered they were cold. Thanks, Brenda. 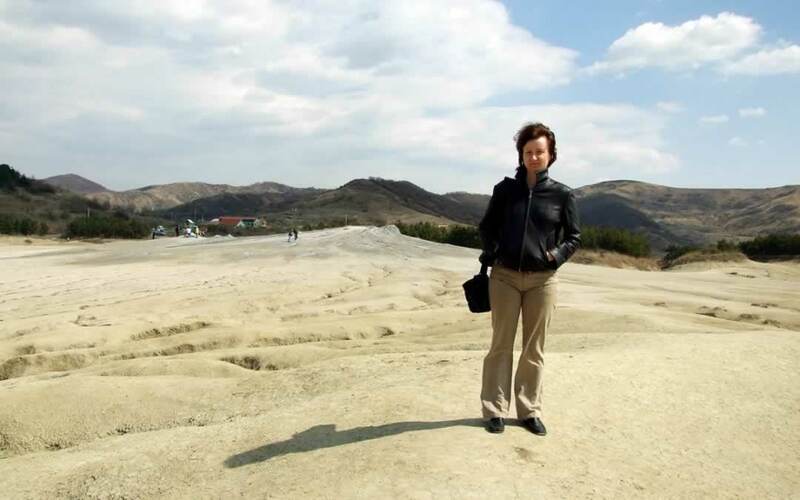 The mud volcanoes at Berca are the only ones in Romania. Unfortunately, until a few years ago, it was difficult to get there, as the road was in pretty bad shape. Now there’s asphalt, but you still need a car or an organized tour to get there. Did you see any of the mud volcanoes erupt? Do they spill out mud all over the place? That must be really fun to watch! It’s interesting to know that they are cold and not hot, and also that they taste salty (how do you know that, haha?). Yes, some of these volcanoes expel mud, but not too high in the air. However, it’s cool to watch those holes bubbling and to listen to the sound they make. Thanks for the interesting idea. We are traveling through Eastern Europe this year so may need to pay these a visit. Great photos too! To begin with, your photos are amazing as well as you site. 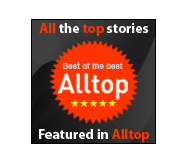 I can’t help but browse through and saw a lot of great articles to read. I think I need to go back to read more of your travel stories. Wow, I had no idea such volcanoes existed on earth! I love outer-space type landscapes and am always looking for new places to take photos! I’m currently in Berlin, so Romania is not out of question for a trip! But I don’t think I’ll eat the mud, haha.